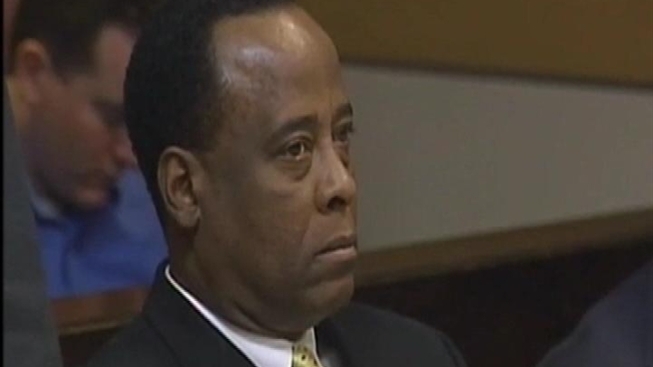 Video of Michael Jackson announcing his "This is It" concert tour will not be allowed into evidence in the involuntary manslaughter trial of Dr. Conrad Murray. Opening statements are scheduled to begin Tuesday morning. Murray is charged in the June 2009 death of Jackson. He pleaded not guilty. It was March 2009 when Jackson made his announcement that he would be doing one final concert tour. Defense attorneys for Murray argued that the tape would demonstrate that Jackson has only agreed to ten shows and he was in poor health. By the time of his death three months later, Jackson was scheduled to do 50. The pressure of added shows resulted in extreme stress for Jackson, according to defense attorneys. Defense attorneys also argued the video would show that Jackson's chemical dependency had started and he was hungover for the announcement. The March 2009 press conference was not relevant to what happened the day Jackson died, Judge Michael Pastor said Monday. Defense attorney Michael Flanagan wanted the jury to hear and see the tape themselves, but now "I guess we're going to have to have it described." The first witness is expected to be called Monday afternoon. That witness is Kenny Ortega, the director of the "This Is It" tour and someone who spent time with Jackson in the days and weeks leading up to his death.